At the heart of Orkney’s World Heritage Site lies the Ring of Brodgar Neolithic stone circle. It was built approximately 4500 years ago and originally comprised 60 megaliths of which only 27 remain, some approaching 5 m in height. A considerable rock-cut ditch up to 3 m deep and 7 m wide was also constructed around the outside of the stone circle. The purpose of the circle and ditch remains a mystery, with theories ranging from use as an astronomical observatory to use as some kind of ceremonial monument. The stone circle sits on a narrow strip of land between the Harray and Stenness lochs – an open setting providing uninhibited views in all directions and ample opportunities for the photographer to capture the stones in varied light and weather conditions. Living only 8 miles away, I have availed of many such opportunities, including ideal conditions for night experimentation with star-trails, the Milky Way and the Aurora Borealis, and have built up quite a portfolio of shots of this location. Reviewing this portfolio in Spring 2014, it dawned on me that the only light I hadn’t played with was moonlight. 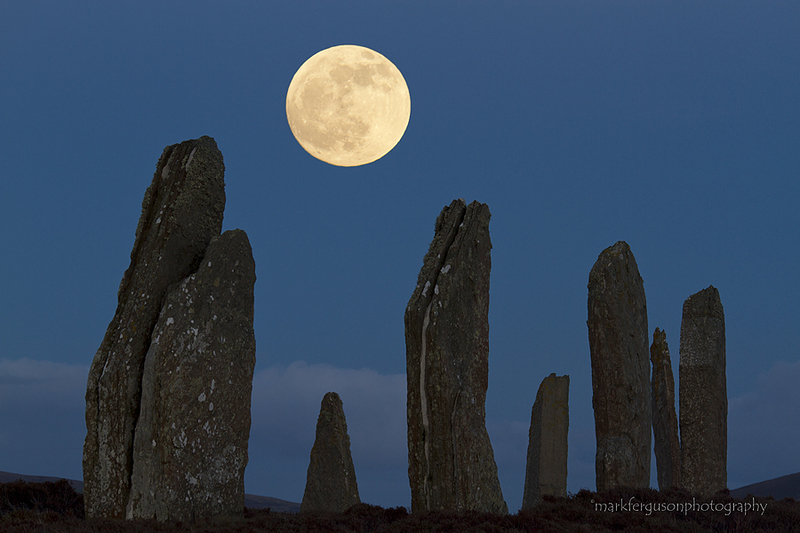 Thus my new project was hatched – to shoot the Brodgar stones under a rising full moon. Studious pre-planning was required to get this shot right, so I consulted the Photographer’s Ephemeris to find a day when a full moon would rise around sunset – I wanted some ambient daylight to balance the brightness of the moon. I also had to find a pleasing composition of non-overlapping stones looking south-east towards the moon. Having visited many times I had a fairly good idea of where to go for this, which I would be able to fine-tune on the night. Eventually I earmarked a couple of potential days in March and April. Fortunately the weather gods were kind to me, and on a clear April evening before sunset I cycled to the stones. The moon was due to rise in the south-eastern sky shortly after sunset so, all things going well, I would see it rise above the stones during dusk. Having set up my heavy zoom lens on a tripod and found a suitable composition I encountered my first obstacle – the ubiquitous Orkney wind. It was only a moderate breeze, but camera and lens were struggling to stay still on the tripod and I knew that any movement would be exaggerated by the zoom. I just had to hope that I would get one stable shot. The second challenge was trying to get both the stones and the moon in sharp focus. This was clearly not possible in one exposure, so I decided to take two consecutive shots, one focussed on the moon, the other on the stones, and then later combine them in processing. As for exposure, I spot metered on the moon so that it wouldn’t appear washed out. I waited until the moon had risen above the stones before pressing the shutter; I had a 10-minute window to take my exposures before the moon rose too high. On quickly reviewing the shots, I was pleased to see that the twilight ambient daylight balanced the moonlight well. I realised that a mere 15-minute shift in the moonrise time would have made balancing daylight and moonlight very difficult. And so as the moon rose higher and the sky darkened I decided to call it a day, content that I had captured some unique images of the stones. Cycling home, I pondered whether any of those huge megaliths could possibly mark the spot on the horizon where the moon rises or sets at certain times of the year. Maybe, just maybe, the Ring of Brodgar was used as a lunar observatory by ancient man … Nobody knows. Canon 7d with sigma 120-400mm lens at 120mm, iso100, 1/6sec at f8, tripod. Two images combined- one focussed on stones and other focussed on moon. This article was published as a main viewpoint in Outdoor Photography magazine April 2015.